Senkyuhyaku-nen no kuchi-e (一九００の口絵) - 1900 frontispiece illustration, from the new series Hyakunen no Hana - Flowers of a Hundred Years, self-printed in an edition of 100 in May 2012. 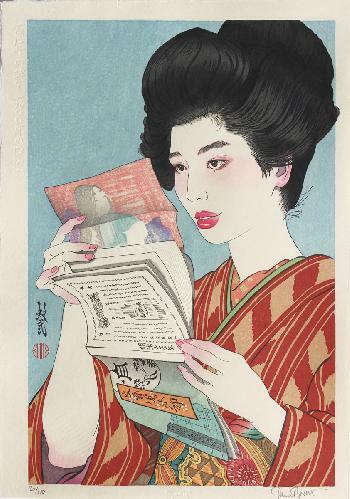 The first of a series of 10 bijin prints illustrating women in the decades of the 20th century. Fine impression, colours and condition: use of blindprinting and 24 carat gold squares in the colour of the inner kimono.